Westhaven Ventures: Fully Financed Follow-Up Drill Program And Skin In The Game | Energy and Gold Ltd.
We all know that the market is a fickle friend and Westhaven Ventures’ shareholders are being reminded of this lesson today. This morning, Westhaven reported the remaining assays from its spring 2018 drilling campaign at Shovelnose, which consisted of 7 diamond drill holes totaling 2,639 meters. 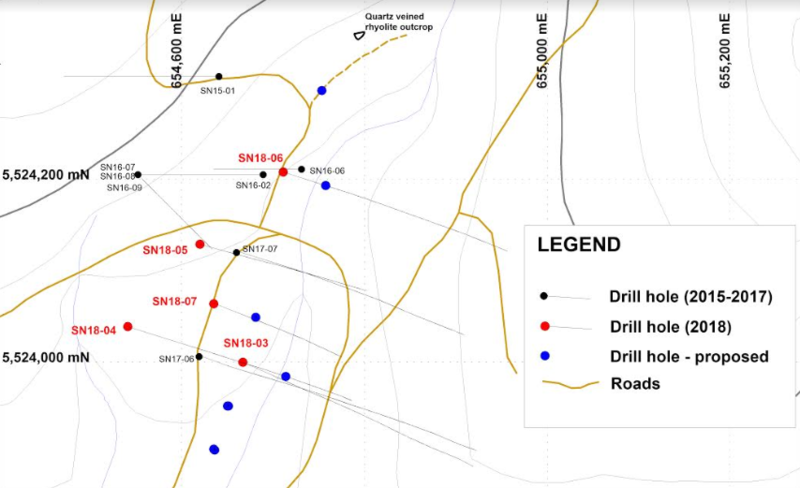 This program resulted in the best drill intercept to date at the Shovelnose gold property and Westhaven President & CEO Gareth Thomas made it clear that they are excited to follow up on hole SN18-03 (2.62 g/t Au over 28.7 meters including 9.7 g/t Au over 2.9m’s), which is open along strike to the north, south and up-dip to the east. It’s not often that I see a junior mining CEO confident enough to stick his neck out in an NR and write “We are confident we are zeroing in on a key, economic-grade gold horizon.” – in my opinion these words represent an impressive degree of confidence. Notice that Westhaven is planning to drill at least four holes in the immediate vicinity of SN18-03 (to the north, east, and south) and the speed with which they want to get back out there tells me that they are confident that they really are zeroing in on an economic-grade gold horizon. One of the things that stands out to me about the Westhaven management team is that these guys care a lot about shareholder value and avoiding dilution – they have a lot of skin in the game through ownership interests in the company and the only way they are going to profit is through making an economic gold discovery that sends the share price higher (total management annual salaries total only C$150,000). Insiders have consistently purchased stock on the open market and exercised warrants, to the point that directors & officers of WHN own roughly 40% of the total shares outstanding. Westhaven runs a tight ship and it is one of the best examples of management’s interests being aligned with shareholder interests that I know of in the junior mining sector. The February-May rally which saw WHN shares more than double set expectations higher and this latest batch of assays clearly didn’t meet those expectations. However, the recent decline has presented investors with a golden opportunity to get in at a sub-C$10 million market valuation just before the company embarks on its most important drill program to date.